We love bacon so a night of all you can eat piggy was always going to appeal to us when we saw a Facebook advert for the Last Chance Saloon. Their Thursday night offering is Bacon Bad. All you can eat bacon dishes for £9.99. Winner, winner, bacon dinner. Fast forward a couple of weeks and we're sat in the Last Chance Saloon. 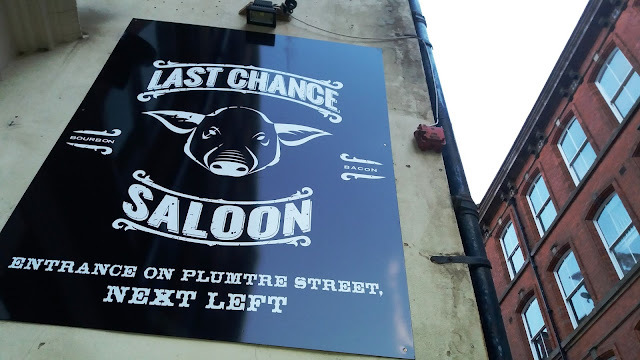 A basement bar on Plumptre Street within Nottingham's Lace Market area a stones throw from the Ice Stadium It's what you imagine a modern version of a Wild West Saloon would look like with lots of wood and plenty of Bourbon displayed above the bar. We chose a table pretty much facing the bar and began to peruse a special meny of piggy related delight. From Bac n'Cheese (Mac and Cheese with added bacon) to Buffalo the Vampire Slayer Wings (Chicken wings wrapped in Bacon). The rule is simple, order 2 items, finish them and you can order 2 more. For £9.99 it sounded like a bargain to us. The Super Cool Bacon Sushi was ridiculously good with rice cake wrapped in bacon with a delicious barbecue sauce for dipping. The rice cake was nice an chewy with the bacon working well as a wrap. They were so good I wish I had a bag full at the recent Rat Race The Wall Ultramarathon event as they would be very easy to eat on the move and were exceptionally moreish. Jumbo chicken wings wrapped in bacon sounds great with a blue cheese dip. The bacon crisping on the outside to lock in the juices of the chicken, keeping it nice and moist. We loved the chicken wings wrapped in bacon. Usually served with a blue cheese sauce we also opted for the Crazy Sauce. The wings were great, 2 good sized pieces wrapped in bacon which kept in some of the moisture for the chicken to be nice and succulent. The Crazy Sauce wasn't quite as mad as it sounds. It had a kick but with a very nice sourness added to some smokey tones like a good hot sauce. With a very American feel to the menu the Chips with Red Eye Gravy sounded good. The gravy was lovely and creamy with a nice hint of coffee whilst being topped with cheese and bacon bits. Nice to try though there were certainly better options on the menu. An all you can eat menu is never going to satisfy everyone in entirely. If you love a good hot dog, Frank 'N' Swine will work for you. A bacon wrapped hot dog with mozzarella cheese in a bun with a covering of Funions. Very easy to pig out on. We also loved the Bac N Cheese. A macaroni cheese with extra cheese and bacon. 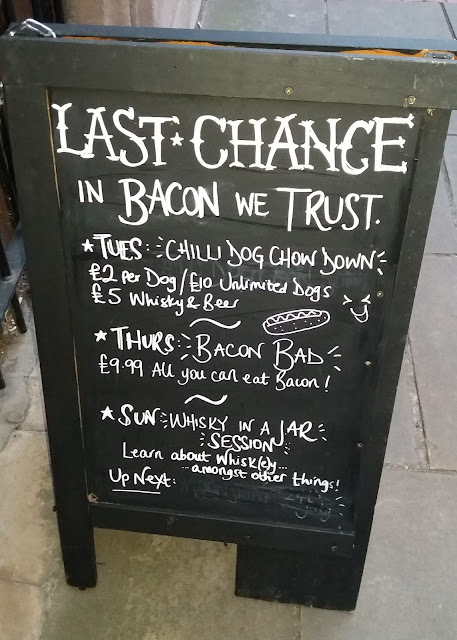 We really enjoyed Bacon Bad at the Last Chance Saloon. Plenty to choose from although after a while it may get a little overkill, although certainly not on the first visit. It's a great variation on the usual all you can eat restaurants in Nottingham and that little bit unique so well worth a visit.